In all Natural health healing remedies nutritional supplements and vitamins are used to improve the nutrition provided by your diet. Proactive use of nutritional supplements and vitamins can result in improved health and longevity. Taking nutritional supplements and vitamins are part of a healthy lifestyle. Anybody interested in better natural health should supplement their diets with nutritional supplements and vitamins. A commonsense guide is presented to achieving good nutrition from taking nutritional supplements and vitamins. Anything that improves your health is worth doing. 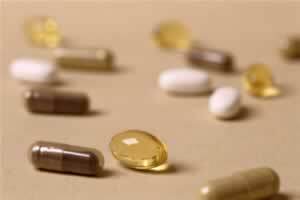 Nutritional supplements and vitamins can improve your health. 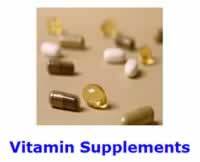 Therefore, certain nutritional supplements and vitamins are worth taking. There are several good reasons for taking nutritional supplements and vitamins. Nutritional supplements are a biological factor of the mind - body connection. The Natural Health approach to nutritional supplements and vitamins is one of realism, moderation, common sense, sanity, honesty, and staying open to new information. The Natural Health Perspective position on taking nutritional supplements and vitamins is that man is mortal. Mortal man does not have the luxury of waiting for the perfect evidence to come in. Prudence often means acting in the midst of uncertainty. Living in an imperfect world often requires decision making with imperfect information. Living is a risky business. "Some nutritional supplements and vitamins are justifiably useful at this point in time." "The epidemiologic studies of hyperhomocysteinemia are impressive enough to give folic acid (or vitamin B6 or B12) supplements to those with elevated homocysteine levels and test patients who have a history of atherosclerotic disease, ... ."
"Clinical use of antioxidant vitamin supplementation may help to prevent coronary heart disease (CHD). ... Current evidence suggests that patients with CHD would probably benefit from taking vitamin E in a dosage of 400 IU per day and vitamin C in a dosage of 500 to 1,000 mg per day." Stephen Barrett, MD., a well-known crusader against health quackery, stated: "In general, supplements are useful for individuals who are unable or unwilling to consume an adequate diet." Researchers obtained information from about 200 men and women participating in a study on diet. The volunteers were 79 years of age and older and were living in a rural section of Iowa, a state in the Midwestern section of the United States. The participants' diets were lacking in variety, with an average of only 22 different foods consumed over the three-day period. In fact, only about 20% of the group consumed adequate amounts of at least 16 essential nutrients. Furthermore, about 40% of the group consumed diets defined by the researchers as inferior, containing adequate amounts of 13 or fewer nutrients. More than half of the respondents' diets were lacking in folate, vitamins D and E, calcium, and magnesium. "It appears prudent for all adults to take vitamin supplements." "I am not a great fan of taking pills, and I think it is desirable to get most of our nutritional needs from our diets, but I also see reasons to take certain supplements." Nutritional supplements and vitamins cost money. Just like eating healthy costs more than eating a lousy western diet, be prepared to spend money on nutritional supplements and vitamins. Living a healthy lifestyle always cost more. The biggest myth of taking vitamins is that if you stuff yourself with enough vitamins, minerals, and other nutritional supplements, you can negate the effects of a poor diet, bad habits and unhealthy lifestyles (such as over or under eating, smoking, and not exercising). "An evolution is occurring in health care as more natural medicines gain acceptance. Interestingly, this acceptance is largely a result of increased scientific investigation and the public's awareness of this research. It appears that medical researchers now have in their possession the technology and understanding necessary to more fully appreciate the value of 'natural' therapies. In essence, many natural therapies are being improved or refined through scientific investigations. Science is paving the way for the medicine of the future--a medicine that recognizes the healing power of nature." -- Encyclopedia of Nutritional Supplements by Michael T. Murray, N.D. In conclusion: from the Natural Health Perspective natural health is about promoting wellness and fitness through the natural therapies of eating a healthy diet, taking nutritional supplements, reaping the benefits of exercise, and having a healthy attitude and resilience in your life. However, Nutritional Supplements and Vitamins are only one part of the Natural Health Perspective. Nutritional Supplements and Vitamins are the least important part, and are the easiest part of a health program to carry out. Once you have covered the basics with Nutritional Supplements and Vitamins, diminishing returns will set in. After a certain point, the benefits that you will obtain from taking each additional new supplement will get smaller and smaller, no matter what the published research says. After a certain point, you must explore other avenues of health to achieve any type of measurable benefit. Stephen Barrett, M.D.,Dietary Supplements: Appropriate Use, 2002.